Create a real leather iPad Mini case printed with your designs on both sides and protect your tablet in style. The soft, unlined interior safeguards your screen from scratches & the slimline build lets you easily carry it around on-the-go. Hand stitched to order, the personalised leather iPad Mini case is a truly bespoke gift. Handmade to order in London, UK. If you're looking for an elegant way to protect your tablet, this personalised leather iPad mini case is the perfect match. 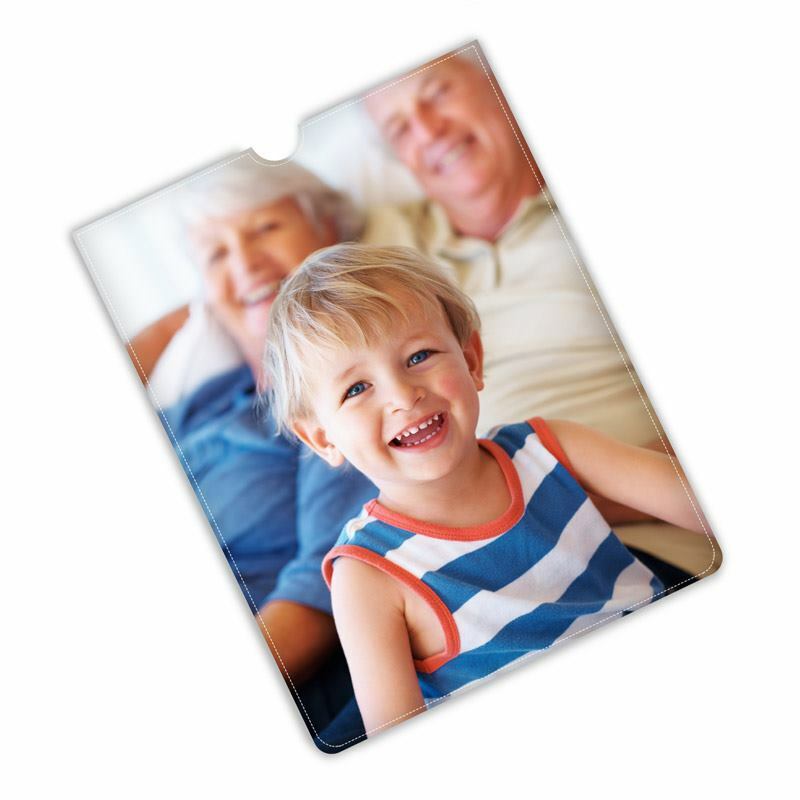 Made from fine, Italian Nappa leather and digitally printed with your photos, design or artwork on both sides, the result is a charming, yet practical, accessory for your iPad. Hand stitched by our team of artisan seamstresses, it's a one-of-a-kind gift that will last for years. Absolutely amazing. Thank you. Great quality and instant delivery. Great service. Thank you again. great service and quality product! Thanks! If you're attending events, iPad Mini custom covers are a unique way to extend the reach of your brand. As your team walks around, make sure their tablets are in a case that features your logo or campaign slogans - a great way to stand out and be remembered. Looking for an original gift idea for couples set to celebrate their 3rd wedding anniversary? An iPad Mini cover personalised with photos from their special day & relationship is not only a unique keepsake, but it's something they can use every day, all year round. Like many of our products, the personalised leather iPad Mini case comes with a quantity discount, so buy one for all the family today and save money. Your designs are printed onto pieces of Italian leather using a specialist process that binds the ink to the leather, creating a long-lasting, vibrant print. When cutting the leather to size, we leave a small indent for the thumb - designed to help you remove the iPad with ease. Our team of artisan seamstresses hand stitch the pieces together creating an elegant iPad Mini leather case. We don't line the reverse of the leather as the natural soft surface protects the tablet from scratches. Make sure important details of your image such as facial features or bits of text aren't placed where the semicircle at the top is, as these might be cut out to make the small access opening. Also, keep your main design features away from the edges as this is where the stitching occurs. In order to get a flawless print, we selectively source the Italian Nappa leather. Being a natural product, there will be a visible grain and pockmarks but this adds to the authenticity and charm of your personalised leather iPad Mini case. Important: We advise against solid blocks of colour all over as this can appear patchy on the natural leather. Photos, patterns and text produce the best results. Each cover is made using bespoke pieces of leather, so there will always be variations in texture, surface and feel between any two cases.